Our ‘Gender Full Spectrum‘ series is a journey through several UN bodies and UNU institutes. Co-organised by UNU-GEST in Iceland and UNU-MERIT in the Netherlands, it presents research findings from a gender perspective, methodological challenges for researching gender, and topical discussions on gender issues. Today we kick off the joint UNU series on gender research ‘Gender Full Spectrum’. Gender is often seen as an isolated one-dimensional issue, rather than for what it is – a multilayered concept touching all of society, including research and policy. Why are we highlighting this today? Because 25th November is the United Nations’ International Day for the Elimination of Violence against Women.This day has been used by activists worldwide for the last 35 years to commemorate the struggle to eliminate violence against women. Worldwide, one in three women have suffered physical or sexual violence in their lifetimes and an estimated 150 million girls have experienced sexual violence. While conflict and migration make women especially vulnerable, VaW remains a problem across all countries and all levels of society. It is a complex and multi-layered phenomenon that takes many forms: from domestic violence to sexual trafficking and female genital mutilation, to economic abuse and the use of sexual violence as a weapon of war. Even when women and men face the same type of violence the consequences affect them in different ways. Therefore, the concept of violence against women, or violence against any person for that matter, needs to be seen in its entirety, as experiences are shaped by interactions between gender, race, ethnicity and sexuality. In the context of violence, women are all too often reduced to mere victims, depriving them of their agency rather than seeing them as active agents of change. This ignores, for example, the crucial role played by women as human rights defenders (HRDs) – either while fighting against VaW or fighting for sexual and reproductive health and rights or women’s rights in general. Worldwide, during these struggles, women ironically are subjected to more violence or muzzling by state and non-state actors. Women’s voices are urgently needed to bring forth change: for example, with the inclusion of women in politics. The presence of female politicians has been linked to policies and laws that protect women, children and vulnerable populations, a lesser likelihood of conflict and improved human rights protection. Yet, while female politicians are essential for achieving gender equality and fighting VaW, female candidates are increasingly targeted in electoral violence – a fact that dissuades many women from running for office in the first place. The use of violence to prevent women from being heard, either as human rights defenders or politicians, is a clear violation of human rights and detrimental to development efforts. 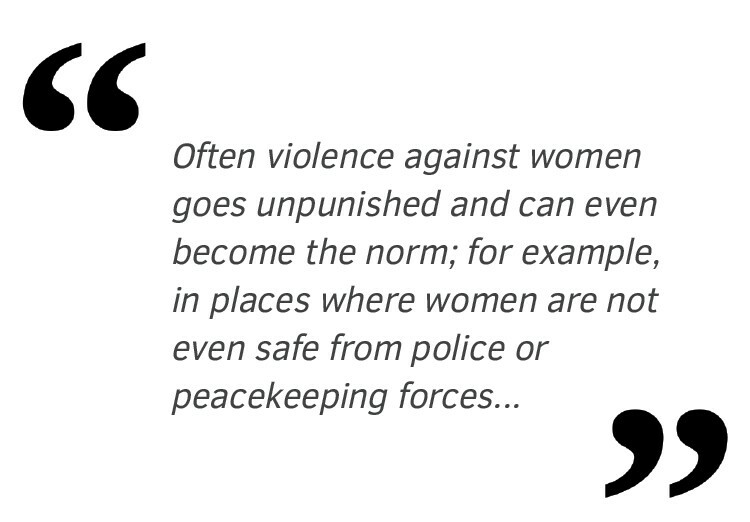 Often VaW goes unpunished and can even become the norm; for example, in places where women are not even safe from police or peacekeeping forces. Even where governments adopt laws to eliminate violence against women, enforcement can falter if the laws are not accepted by society. Put simply, there can be a backlash against women human rights defenders, politicians or anyone fighting for women´s rights.. The case of Afghanistan highlights how the threats against (women) HRDs grew following increasing participation of women in public life and the Ending Violence Against Women Law which was adopted in 2008 was even called ‘un-Islamic’ when discussed in Parliament. Additionally, VaW has a major impact not only on the individual but also her family and society as a whole. It hinders poverty reduction, decreases rates of education, and increases rates of mental health problems and HIV/AIDS. Combating VaW has therefore been recognised in the 2030 Sustainable Development Agenda, with specific goals and targets (SDG 5, targets 5.2 and 5.3) addressing all forms of violence and harmful practices against women and girls, which is now seen as central to achieving gender equality and women´s empowerment, which is essential for sustainable development. This is also the first time that a global development agenda has addressed all forms of violence against women. As this small overview on VaW shows, the role of gender is versatile and multilayered, demanding a “full spectrum” view across disciplines and research interests. With this series we aim to raise awareness about the diverse gender-related research undertaken within the UNU and beyond, and to make it available to a wider audience. The intention is to present gender as an all-encompassing dimension, while highlighting the different roles that men and women can play in researching gender. The series will explore a wide range of themes across disciplines and methodologies: from value chains in fisheries, gender and environment, to migration and political participation. The wide variety of research within UNU will provide a compelling and policy-relevant mix of articles offering stimulating insights for a wide audience.